Charleston AAFld, SC, 12 Jun-13 Sep 1945. Lt Col Jack G Merrell, 14 Apr 1945-unkn. Air Combat, EAME Theater; Air Offensive, Europe; Sicily; Naples-Foggia; Normandy; Northern France; Rhineland; Ardennes-Alsace; Central Europe. Distinguished Unit Citation: Ploesti, Rumania, 1 Aug 1943. 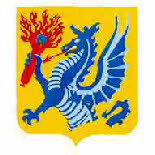 Constituted as 389th Bombardment Group (Heavy) on 19 Dec 1942 and activated on 24 Dec. Prepared for duty overseas with B-24's. Moved to England, Jun-Jul 1943, and assigned to Eighth AF. Almost immediately a detachment was sent to Libya, where it began operations on 9 Jul 1943. The detachment flew missions to Crete, Sicily, Italy, Austria, and Rumania. The group received a DUC for the detachment's participation in the famed low-level attack against oil refineries at Ploesti on 1 Aug 1943. For his action during the same operation, 2d Lt Lloyd H Hughes was awarded the Medal of Honor: refusing to turn back although gasoline was streaming from his flak-damaged plane, Lt Hughes flew at low altitude over the blazing target area and bombed the objective; the plane crashed before Hughes could make the forced landing that he attempted after the bomb run. The detachment returned to England in Aug and the group flew several missions against airfields in France and Holland. Operating temporarily from Tunisia, Sep-Oct 1943, the 389th supported Allied operations at Salerno and hit targets in Corsica, Italy, and Austria. Resumed operations from England in Oct 1943, and until Apr 1945 concentrated primarily on strategic objectives in France, the Low Countries, and Germany. 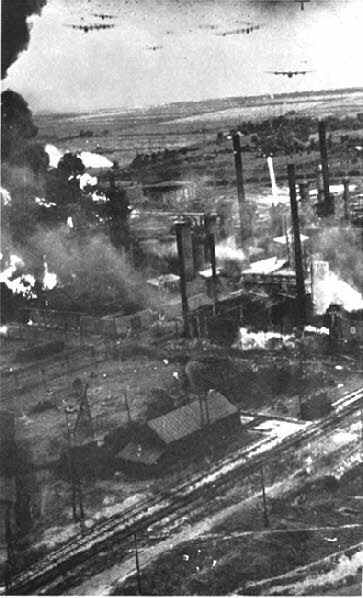 Targets included shipbuilding yards at Vegesack, industrial areas of Berlin, oil facilities at Merseburg, factories at Munster, railroad yards at Sangerhausen, and V-weapon sites at Pas de Calais. 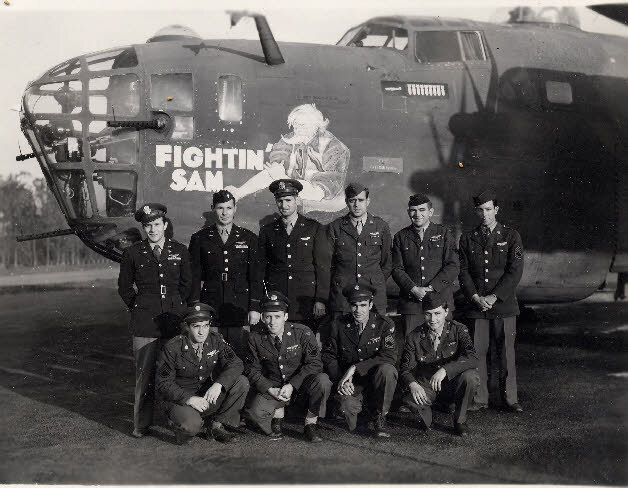 Participated in the intensive air campaign against the German aircraft industry during Big Week, 20-25 Feb 1944. Also flew support and interdictory missions on several occasions, bombing gun batteries and airfields in support of the Normandy invasion in Jun 1944, striking enemy positions to aid the breakthrough at St Lo in Jul 1944, hitting storage depots and communications centers during the Battle of the Bulge (Dec 1944-Jan 1945), and dropping food, ammunition, gasoline, and other supplies to troops participating in the airborne assault across the Rhine in Mar 1945. Flew last combat mission late in Apr 1945. Returned to the US, May-Jun 1945. Inactivated on 13 Sep 1945.